In Stock Only! Dealer Trades/Ordered Vehicles/Locates not inclluded in this program. For returning Faulkner Buick GMC Loyal customers. 1In Stock Only! Dealer Trades/Ordered Vehicles/Locates not inclluded in this program. For returning Faulkner Buick GMC Loyal customers. 2Not available with lease and some other offers. See dealer for details. 3Must finance through GM Financial. Some customers may not qualify. Not available with some other offers. See dealer for details. 4Monthly payment is $13.89 for every $1,000 you finance. Average example down payment is 4.5%. Some customers may not qualify. Not available with leases and some other offers. Take retail delivery by 4/30/19. See dealer for details. 1In Stock Only! Dealer Trades/Ordered Vehicles/Locates not inclluded in this program. For returning Faulkner Buick GMC Loyal customers. 2Monthly payment is $13.89 for every $1,000 you finance. Average example down payment is 4.5%. Some customers may not qualify. Not available with leases and some other offers. Take retail delivery by 4/30/19. See dealer for details. Lease for $296/month for 36 months with $2,760 due at signing and 10,000 miles per year. Payment expires on 04/30/19. Lease for $298/month for 36 months with $2,776 due at signing and 10,000 miles per year. Payment expires on 04/30/19. Estimated Lease payment based on 36 months and $2,776 due at lease signing. Excludes title, taxes, registration, and license fees. Mileage charge of $0.25 per mile over 10,000 miles. Not all consumers will qualify. Residency restrictions may apply. Lease for $300/month for 36 months with $2,792 due at signing and 10,000 miles per year. Payment expires on 04/30/19. Estimated Lease payment based on 36 months and $2,792 due at lease signing. Excludes title, taxes, registration, and license fees. Mileage charge of $0.25 per mile over 10,000 miles. Not all consumers will qualify. Residency restrictions may apply. Lease for $323/month for 36 months with $2,916 due at signing and 10,000 miles per year. Payment expires on 04/30/19. Estimated Lease payment based on 36 months and $2,916 due at lease signing. Excludes title, taxes, registration, and license fees. Mileage charge of $0.25 per mile over 10,000 miles. Not all consumers will qualify. Residency restrictions may apply. 1In Stock Only! Dealer Trades/Ordered Vehicles/Locates not inclluded in this program. For returning Faulkner Buick GMC Loyal customers. 2Not available with lease and some other offers. See dealer for details. 3Monthly payment is $13.89 for every $1,000 you finance. Average example down payment is 4.5%. Some customers may not qualify. Not available with leases and some other offers. Take retail delivery by 4/30/19. See dealer for details. Lease for $321/month for 36 months with $2,900 due at signing and 10,000 miles per year. Payment expires on 04/30/19. Estimated Lease payment based on 36 months and $2,900 due at lease signing. Excludes title, taxes, registration, and license fees. Mileage charge of $0.25 per mile over 10,000 miles. Not all consumers will qualify. Residency restrictions may apply. 1Not available with special finance or lease offers. See dealer for details. 2In Stock Only! Dealer Trades/Ordered Vehicles/Locates not inclluded in this program. For returning Faulkner Buick GMC Loyal customers. 3Not available with special finance or lease offers. See dealer for details. 4Must finance through GM Financial. Some customers may not qualify. Not available with some other offers. See dealer for details. 5Monthly payment is $13.89 for every $1,000 you finance. Average example down payment is 4.5%. Some customers may not qualify. Not available with leases and some other offers. Take retail delivery by 4/30/19. See dealer for details. Lease for $340/month for 36 months with $3,052 due at signing and 10,000 miles per year. Payment expires on 04/30/19. Estimated Lease payment based on 36 months and $3,052 due at lease signing. Excludes title, taxes, registration, and license fees. Mileage charge of $0.25 per mile over 10,000 miles. Not all consumers will qualify. Residency restrictions may apply. Lease for $373/month for 36 months with $3,299 due at signing and 10,000 miles per year. Payment expires on 04/30/19. Estimated Lease payment based on 36 months and $3,299 due at lease signing. Excludes title, taxes, registration, and license fees. Mileage charge of $0.25 per mile over 10,000 miles. Not all consumers will qualify. Residency restrictions may apply. Lease for $444/month for 36 months with $3,872 due at signing and 10,000 miles per year. Payment expires on 04/30/19. Estimated Lease payment based on 36 months and $3,872 due at lease signing. Excludes title, taxes, registration, and license fees. Mileage charge of $0.25 per mile over 10,000 miles. Not all consumers will qualify. Residency restrictions may apply. Lease for $449/month for 36 months with $3,859 due at signing and 10,000 miles per year. Payment expires on 04/30/19. Estimated Lease payment based on 36 months and $3,859 due at lease signing. Excludes title, taxes, registration, and license fees. Mileage charge of $0.25 per mile over 10,000 miles. Not all consumers will qualify. Residency restrictions may apply. Lease for $510/month for 36 months with $3,884 due at signing and 10,000 miles per year. Payment expires on 04/30/19. Estimated Lease payment based on 36 months and $3,884 due at lease signing. Excludes title, taxes, registration, and license fees. Mileage charge of $0.25 per mile over 10,000 miles. Not all consumers will qualify. Residency restrictions may apply. 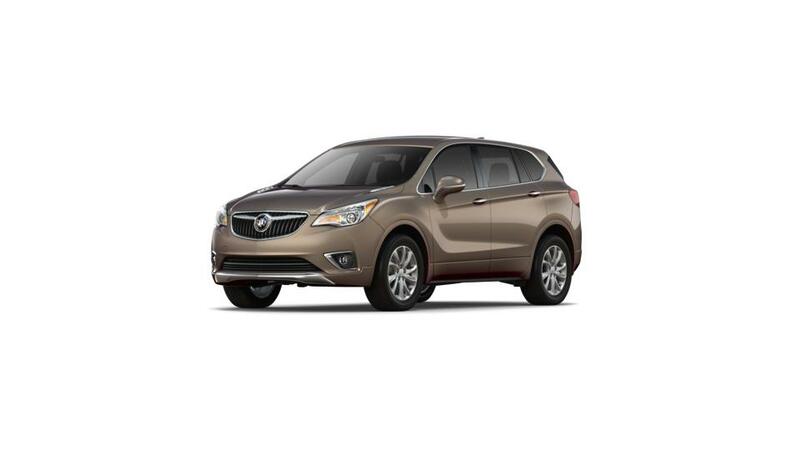 Discover the new Buick Envision at our Trevose dealership. This fantastic vehicle combines style, performance and comfort to give an unbelievable experience to you and your friends. The Buick Envision’s interior is designed with state-of-the-art technology and innovative safety features. Play music, access maps, make phone calls, and much more with advanced technologies available in this vehicle. Get in touch with our experts at Faulkner Buick GMC Trevose and know more about this amazing vehicle. We hope to see you soon!